Pink Floyd recently celebrated their early years with a massive box set spanning from the band’s formation in 1965 up until the recording of Dark Side of the Moon in 1972. Crucial for this period, was the transition between Syd Barrett and David Gilmour and how Gilmour’s evolving tone, shaped the sound of the band’s early albums. This is an updated version of the original feature posted in March 2008. Prior to joining Pink Floyd, David played in several local Cambridge bands. His gear was mainly based on a limited budget and borrowed stuff. While with Jokerâ€™s Wild (1964-66), he is seen using a Hofner Club with Bigsby tremolo and Vox amps. David got his first Fender in March 1967. A mid 60â€™s white Telecaster with a rosewood neck that his parents gave him for his 21. birthday. 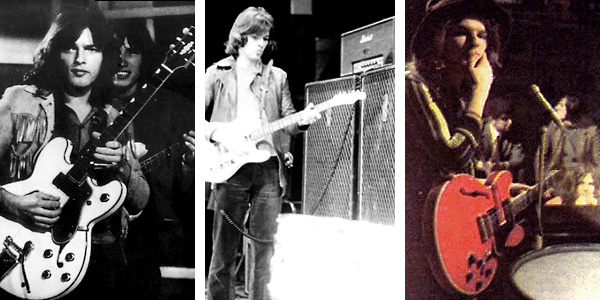 David is seen using the guitar with Bullitt, – his last band prior to joining Floyd. Bullitt was to reunite on Davidâ€™s first solo album in 1978. – Mid 1960â€™s all stock Fender Telecaster with a white ash body, white pickguard and a rosewood neck. – Sydâ€™s 1960â€™s Fender Telecaster with a white ash body, white pickguard and a rosewood neck. Syd later reclaimed his old guitar during the Saucerful recording sessions. – Fender Telecaster of unknown date with natural brown body, white pickguard and a maple neck with a small headstock. – Selmer Stereomaster 100w head with 4x ECC83, 4x EL34, 2x GZ34 tubes. – Selmer 2×12â€ All Purpose speaker cabinet. – Selmer 1×18â€ Goliath speaker cabinet (seen used from autumn â€™68). – Also seen using a Cry Baby wah wah, Royal Festival Hall, London UK April 14. 1968. – “Flaming” Bouton Rouge TV-show, Paris France February 20. 1968 (Davidâ€™s first TV appearance). You can spot David’s rig behind him to the right, his main setup throughout â€˜68, – a Selmer Stereomaster amplifier and a Selmer â€œAll Purposeâ€ cabinet. Notice the second Telecaster leaning up against the amps. David borrowed this from Syd for a brief period. David got his first Stratocaster in June 1968. It was a gift from the band. 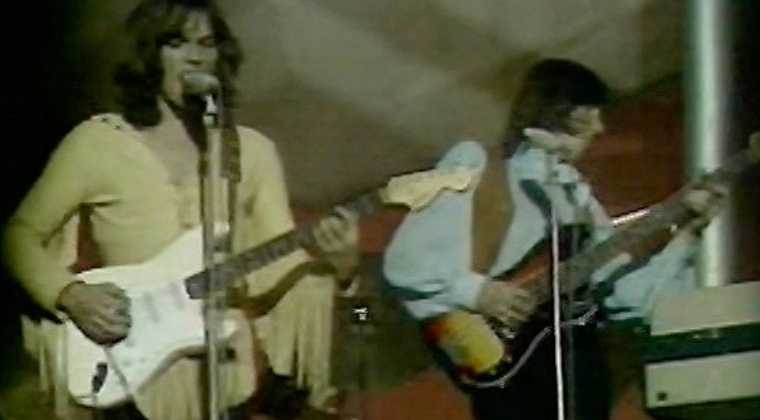 The first known footage of the guitar is from the Hyde Park Free Festival on June 29. Just a couple of weeks before the band headed to the States. The gift couldnâ€™t have come at a better time. When Floyd headed over to the US in medio July Davidâ€™s Telecaster got lost by the Airline company and the white Stratocaster became is main axe for the next couple of years. David is also seen with a natural brown Fender Telecaster later the same year. It’s not documented when he bought the guitar but one can assume that it was purchased during their US summer tour. In several interviews throughout the years David has stated that he felt quite lost after joining Pink Floyd. It was a combination of joining a band that was totally in limbo after loosing their main songwriter and having to fill the shoes of a brilliant front figure. Now we can look back at the whole transition and see that it went remarkably well because the band managed to promote themselves with a new album, while touring extensively throughout the spring, summer and fall of â€˜68. Most of their fans didnâ€™t even know the difference between Syd and David, mostly because the band had, after all, only been around for a couple of years, with only one album on their hands. David played on most of Saucerful and by its release, he was a full member of the band. One could sense that although David tried to maintain some of Sydâ€™s original guitar work on the songs they performed, he would also incorporate new elements. Much of it with a distinct Hendrix flavour. This was 1968, – still a few years before the stompbox frenzy and David relied on the few that were available – fuzz, wah wah and echo. Jimi Hendrix was famous for his screaming fuzz tones and his use of the whammy/tremolo arm and David picked up much of this technique. The big difference was Davidâ€™s use of echo, which made his sound quite unique at the time. David was also a huge fan of Hank Marvin and The Shadows, who not only were a huge influence on his playing (listen to early 1972 versions of Breathe and Mihalis, from David’s 1978 solo album), but Marvin, and lost of other surf and beat guitarists, used echo as a part of their tone. – “Let There be More Light” Tous en Scene TV special, Paris, France October 31. 1968. One can easily notice that the band is getting heavier and David seems to loosen up a bit. A great clip showing Davidâ€™s autumn â€™68 setup. Pay attention to the saturated Fuzz Face solo and the use of the wah wah. Itâ€™s easy to hear the Hendrix influence in tunes like Let There Be More Light, Corporal Clegg and The Nile Song. That over-saturated, earpinching (germanium) fuzz tone and the heavy use of the tremolo arm. Like Hendrix David was also a master at getting the most of his limited setup and they both had a unique way of using the guitar volume knob to adjust the gain on the fuzz. David would roll off the volume for a mild overdrive tone used on verse and chorus parts and then turn it up to 10 for the solos. David would also use the guitar volume to create echo swells, by rolling back the guitar volume control, letting the echo sustain. This was a technique that would characterise the sound of Pink Floyd in the years to come. Loosing the main songwriter and driving force in the band meant that Floyd had to readjust and seek out a new direction. Perhaps it was desperation but psychedelia pop already belonged to the past and the band searched deeper into their folk and blues roots, while at the same time continuing to experiment with electronic effects. David had also developed a very unique style using slides and echo to create soundscapes and noise and with the equally haunting Farfiza sounds from Richard Wright, Pink Floyd soon got the label â€œspace rockâ€. It was only fitting that they would be invited by several European TV networks to perform to the landing on the moon in July 1969. – Royal Festival Hall, London UK April 14. 1969. This footage is from the rehearsals for the premiÃ¨re of Pink Floydâ€™s new suite â€œThe Man and The Journeyâ€ that consisted of old repertoire and new songs and improvisations. It was all very innovative at the time and kind of a distant cousin of what would later turn into conceptual ideas for Dark Side of the Moon. The clip reveals Davidâ€™s setup only a couple of months before he started using Hiwatt amps. Notice the spare brown Telecaster lying on the floor and the Cry Baby wah wah, – he normally used Vox wahs at the time. By summer 1969 David had started using Hiwatt amplifiers. A relationship that would last for over 40 years (and counting) only interrupted in the mid 80â€™s. Itâ€™s not documented when David bought the amps but one of the first known pictures is taken at the Van Dike Club, Plymouth, UK, August 1. 1969. The Hiwatt amp was designed by Dave Reeves who had been making amps since the mid 60â€™s and worked for Sound City in London between 1966-â€™68. In early â€™69 he began making custom 100w heads for musicians under his new brand Hiwatt. Both Jethro Tull and The Who are seen using Hiwatts as early as May â€™69 and the word must have spread quickly. David is seen using Selmer amps at the Royal Festival Hall show on April 14. but a theory could be that he bought the Hiwatts in July, as the band was vacant for most of the month. His setup for the remainder of 1969 included two Hiwatt DR103 heads and two WEM speaker cabinets. – Hiwatt DR103 All Purpose 100W heads with Mullard 4xEL34â€™s power tubes and 4xECC83â€™s pre-amp tubes. Controls for normal volume, brilliance volume, bass, middle, treble, presence and master. – WEM Super Starfinder 200 cabinets with 4×12â€ Fane Crescendo speakers with metal dust caps. It is also claimed that David used Sound City amps. A couple of heads can be seen on the back of the Ummagumma album cover, with the band’s gear being spread out on a runway. However there are no pictures or other sources confirming this and it seems that he went straight from Selmer to Hiwatt. The Sound City L100 amps are All Purpose and could easily have been used by Waters or Wright or brought on a spares. Odd equipment: (left) David playing what appears to be a frankenstein Gretsch-ish guitar at on Samedi et Compagnie ORTF TV Paris, France September 21. 1968. (middle) David sometime early 1968 with his mid 1960s Telecaster plugged into what appears to be either in-house or borrowed Marshall Plexi and two VOX cabinets. (right) David playing a Gibson ES 355 on Forum Musiques, ORTF TV Paris, France January 22. 1969. There are different reports (and opinions) on whether David is playing on all of the Saucerful album or not (apart from Jugband Blues). Syd had been let go but contributed one song and most likely played on Remember a Day. Saucerful of Secrets was, as its predecessor, drenched with studio trickery, yet the atmosphere is darker and less pop oriented. David used his live rig on the album, with the basic effects lineup (see list above for the 1968 gear). As Saucerful was completed before he got his first Strat, so he only used the Telecaster and the Selmer amps. The white Strat was largely used on both More and Ummagumma and both albums were recorded before he got the Hiwatts, so again, he used the Selmer amps. All three albums includes several songs with acoustic guitars. Gilmour is seen using a Levine â€œWesternâ€ steel string on several occasions, most notably at the Royal Festival Hall concert in April 1969. Both Crying Song and Cymbaline from More include an undocumented acoustic nylon string guitar. David’s first known use of a Leslie speaker can be heard on Narrow Way (part 3) from Ummagumma. The song features Davidâ€™s white Stratocaster into a Leslie 147 throughout the song. Pink Floyd would tour for the rest of 1969 and also record music for the film Zabriskie Point. The â€œThe Man and the Journeyâ€ suite would prove it self to be a wakening for the band, – they was indeed capable of producing unique music and shows without Syd. There was a strong unity in the band and an urge to experiment with ways of expressing themselves. 1970 would see some interesting projects and a dramatic change in Davidâ€™s sound and rig. i am looking for days now maybe you can help me. Is there a pedal out there that can do the sound of an Selmer Amp? So i can get the CLEAN sound of early Pink Floyd? I have a Vox Amp without Bass and Treble. Or will any pedal with treble and Bass will do the trick? Thanks! And by the way really great site you made here. Gongrats! I have never played those old Selmer amps so I can’t really tell. From what I understand, they’re similar to the early Marshall Plexi and Vox AC30s although I might be mistaken. It’s no Hiwatt. I would imagine that a Powrbooster or a Plexi type of pedal, like the JHS Charlie Brown would do the trick but maybe there’s something closer out there, I don’t know. odd question maybe…Does anyone know which guitar strap he used in 1968? thanks for your help! Hi Bjorn, first of all thanks for your fantastic job with this website. I think you helped a lot of people out there! I’m a fan of Pink Floyd’s first albums, in particular Meddle and A Saucerful of Secrets. Currently i play with an Hiwatt T40 and a Fuzz Face and i get my overdrive sound with the guitar’s volume knob. However i would like to get that Selmer tone of the early years. Which pedal would you suggest for get the sound of Corporal Clegg or Interstellar Overdrive? (Yes, i know it isn’t a song written by David but that intro’s riff is the exact sound i want to obtain :D ). Thanks for the kind words, Theo! I think you should be able to nail those tones with the setup you already have. The Selmer is perhaps closer to a VOX or early Marshall, with less compression and mid range than the Hiwatt but he used a germanium Fuzz Face and Telecaster for those songs, so it shouldn’t be a problem. After 4:30 minutes, Dave plays a song with the acoustic guitar. I can not figure out what song he plays. Surely someone can help me? Bjorn, have you noticed that his first Hiwatts were modified in the 1970-71 films in the Early Years boxed set. The Brilliant Volume pots have been removed and taped over, and the upper and lower normal inputs are taped over. I saw your thread on that. I haven’t bought the box but interesting info anyway. Thanks! Bjorn, I apologize for going completely off-topic, but have you made any progress since we have talked about Amplitube Gilmour expansion, I believe guys from IK Multimedia have contacted you some time ago about it. Once you said you were working on the tones, can you tell if it’s going anywhere? I wish they made a proper offer, though. If anyone can make a definitive Gilmour discography patch-list, it’s either you or David himself. Ok, I was messing around with Amplitube just prior to the release of 4 so I haven’t got that one yet. Are the patches for 3 also possible to load in 4 or is it a completely new environment and platform? Yes, patches of Amplitube 3 can be loaded in version 4 as it has all the gear from version 3 plus some new stuff. I kept 3 anyway, just in case. It’s always a pleasure to read something as Gilmourish, continuously updated and full of peculiarities. I’m Italian, precisely from Rome and my luthier is trying (at my request) to make a worn copy of Esquire Workmate, that beauty appeared on About Face lp and still in tour with The Man. We’ve founded many pictures of David wearing that guitar, but we can’t find anything that show the back of it and the state of consumption where it is, as same as news ’bout what kind of pick-ups have been used, both neck (fitted by Seymour Duncan himself) or bridge (so far we were able to know that it is an original of the time but we don’t know the output). Even my luthier have found the E-mail of Phil Taylor and have sended a message to him, but he didn’t answer very satisfying (he just said “not so much worn”…really English!). Any news bringing serenity to me and to my luthier will be well accepted. Obviously, the pictures of the final product will be posted on Gilmourish completely available to each of you, with prior consent of Bijorn himself. Thanks again for the help that you’ll give me.